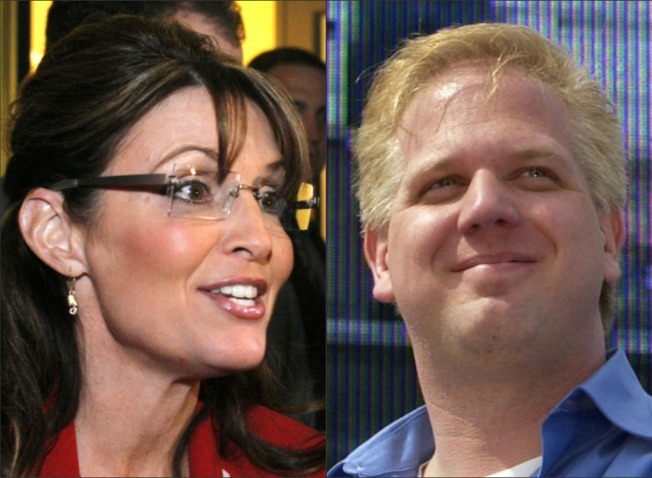 If Sarah Palin wants to run with Glenn Beck, she'll have to play second fiddle, says Fox talker. If Glenn Beck makes a White House run in 2012 with Sarah Palin, his name has to come first, the firebrand broadcaster said. Palin was recently asked if she would consider Beck as a running mate and said she considered him "a hoot," a characterization Beck took issue with on his Wednesday radio show. "I mean, you'd have to live up to the evil conservative stereotypes, you'd have no choice, you'd have to. Look, I talked to the woman about it, I don't even know what she was saying." Beck's tongue-in-cheek misogynistic rant continued, ensureing that even with a woman on his ticket he will not get the votes of any women should he run. "Can you imagine what an administration with the two of us would be like? Come on!" Beck said. "She'd be yapping or something and I'd say, 'I'm sorry, why am I hearing your voice? I'm not in the kitchen.' I mean, you'd have to live up to the evil conservative stereotypes, you'd have no choice."